You could spend a week in Florence and still not see all of the masterpieces in the city, so between gelatos make sure to see the best! 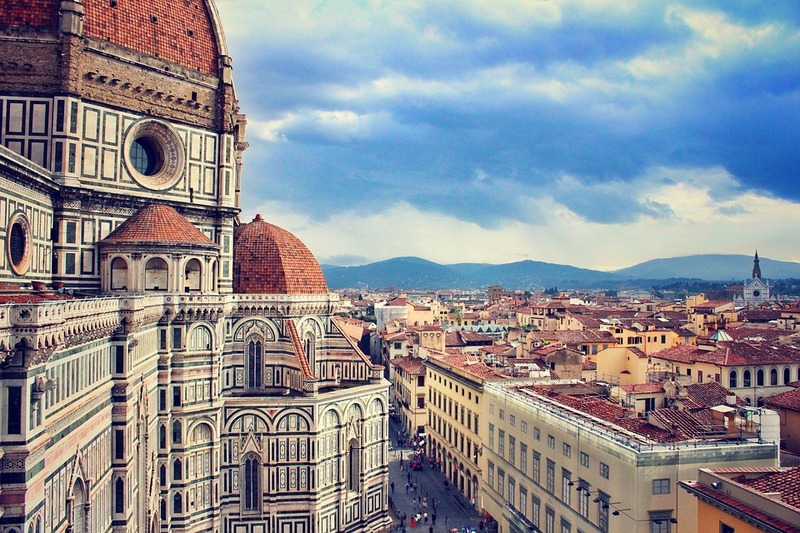 To start, walk to the defining feature of the skyline: Brunelleschi’s Dome at Cattedrale di Santa Maria del Fiore. This incredible feat of architecture, like most Florentine tourist attractions, is a product of the wealth cultivated in Florence during the Renaissance. At the time, Italy was made up of independent city-states like Venice, Florence, Pisa, and Rome who competed for resources and prestige. From the 14 th to the 18 th centuries, Florence was led by a wealthy merchant family, the Medici, who funded art and architecture projects that made Florence internationally famous. One of their projects, the Palazzo Vecchio, functions as a museum where you can walk through extravagantly decorated rooms before climbing to the top of a tower with the best view in Florence (note: the staircase to the top is 416 steps, so wear comfortable shoes). I suggest climbing the Palazzo Vecchio tower instead of Brunelleschi’s Dome because the view from the tower includes a perfectly framed view of Cattedrale di Santa Maria del Fiore. In the same piazza, you can see another Medici creation, the Uffizi Galleries, which houses masterpieces from their private collection including works by Giotto, Michelangelo, Leonardo da Vinci, and many (many) more. Since the scale of these galleries can be daunting, consider joining a tour so you can skip to the highlights and better understand the significance of everything you see. Even if you’re getting museum fatigue, you need to see Michelangelo’s David in the Museo Nazionale del Bargello. Before I saw the David, I didn’t understand what made Michelangelo so much more famous than his contemporaries, but when I walked around the colossal statue in person, I understood. The David has incredibly human-like features, and the naturalism in such a massive stone sculpture is truly breathtaking. Walk across Ponte Vecchio (the old bridge) and do a little window shopping on your way to Palazzo Pitti and the Boboli Gardens. Though the Pitti Galleries have many important works, on a nice day you can skip the museum and head right to the incredible gardens. Explore this massive complex to find beautiful statues, fountains, and landscape architecture intended to wow. You can also gain entry to the nearby Bardini Gardens, which offer another incredible view of the city from above. To complete your busy days, take part in the best Italian tradition: aperitivo. Starting around 6pm, restaurants offer aperitivo, where you pay for an alcoholic drink and in exchange get access to snacks! In some restaurants, the offering is small finger food, but in others, there is a buffet that certainly suffices for dinner. One of my favorites is PopSugar in Piazza Santo Spirito, for 8€ you get a drink and access to a delicious buffet that lasts all night. Before you leave Florence, go up to the Piazzale Michelangelo where you can buy your souvenirs with a panoramic view of Florence and the Arno river. For romance, go at sunset with a bottle of wine, or eat outside at the upscale restaurant carved into the hillside. In Florence, you can have your own taste of La Dolce Vita!